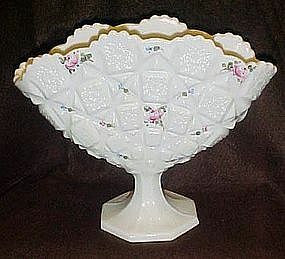 Lovely milk glass fan vase sits on a 8 sided pedestal foot base and is in the old quilt pattern. Decorated with pink roses and tiny blue flowerettes. I believe it is decoration #32. There are no bows. Measures 7" tall and is in excellent condition. Marked WG.